Rate this project Peppermint OS is a lightweight, Ubuntu-based distribution that features a desktop environment made up of Xfce and LXDE components. 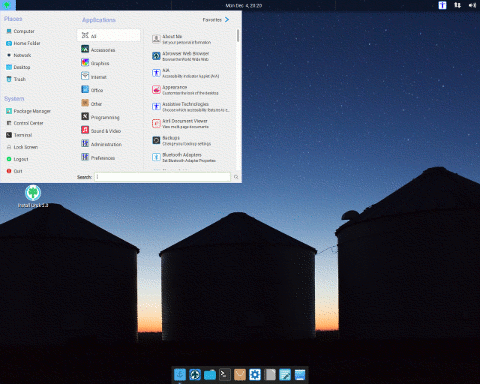 The project's latest release, version 9, is based on Ubuntu 18.04 LTS and features several small changes. "We have replaced lxrandr with xfce4-display-setttings for monitor settings as we continue to look for better options that add functionality without adding weight, and to continue the migration away from the few remaining LXDE components. By user request the Menulibre menu editor is now installed by default, and no longer breaks the menus as it did in previous Peppermint versions. Continuing the theme of improved menu and launcher management, there is now a right-click 'Create new launcher here' desktop context menu item. The Nemo file manager now has a right-click 'Send by email' context menu item. (requires an email client such as Thunderbird to be installed). The Panel Reset function in the Peppermint Settings Panel no longer needs to log you out of your session to reset the panel. The Xfce Panel Switch utility is now installed by default, so you can now backup/restore any custom panel configurations and switch between them. It includes a Peppermint-9 default profile and a few others to play with." A complete list of changes can be found in the release announcement. Downloads can be found on the project's home page. Download: Peppermint-9-20180621-amd64.iso (1,311MB, signature, torrent, pkglist). Peppermint OS is a lightweight distribution based on Lubuntu. The Peppermint team has released a new minor update to the project's version 8 release. The new installation media features bug fixes and an updated version of the Linux kernel. "This is a security refresh of the Peppermint 8 ISO images to include all updates to date (as of 3rd Feb 2018), including the Meltdown and Spectre mitigations such as the new HWE kernel 4.13.0-32 and the latest Chromium web browser version 64. The new ISO also contains bug fixes for flash content in ICE SSB's, and Chromium not remembering user selected xdg-open preferences for magnet and mailto links. There is no need for Peppermint 8 or Peppermint 8 (first) Respin users to reinstall this version, the mitigations and bug fixes have already been pushed as automatic updates to the earlier Peppermint 8 versions. 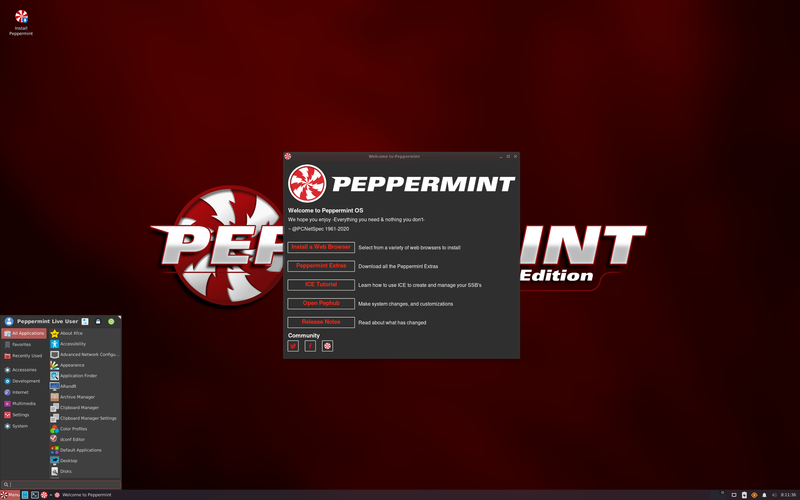 Peppermint 8 Respin-2 is still available in 32-bit and 64-bit editions, with the 64-bit edition having full UEFI and Secureboot support." A list of changes and fixes can be found in the project's release announcement and in the release notes. Download (SHA256): Peppermint-8-20180203-amd64.iso (1,272MB, signature, torrent, pkglist).